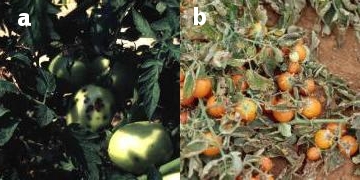 Bacterial spot is among the most important diseases of tomatoes (Solanum lycopersicum L.) grown in the open field under humid environments (Jones et al., 2005). This article compiles information from extension resources describing bacterial spot disease and management. Figure 1. Bacterial Spot of tomato. (a) Bacterial spot symptoms on tomato fruit. (b) Defoliation due to bacterial spot. Photo credits: David Francis, The Ohio State University. Bacterial spot causes yield loss in tomato through reduced photosynthetic capacity and defoliation. Fruit quality is reduced indirectly due to sun-scald and directly by bacterial lesions. Bacterial spot of tomato is caused by as many as four species of Xanthomonas, including Xanthomonas euvesicatoria, X. vesicatoria, X. perforans, and X. gardneri. In addition, at least five physiological races—T1–T5—are recognized on the basis of a hypersensitive (HR) reaction on a differential series of host genotypes. Descriptions of bacterial spot may use the species names, taxonomic groups A–D, or race designations. Jones, J. B., G. H. Lacy, H. Bouzar, G. V. Minsavage, R. E. Stall, and N. W. Schaad. 2005. Bacterial Spot – Worldwide distribution, importance and review. Acta Horticulturae (ISHS) 695: 27–34. (Available online at: http://www.actahort.org/books/695/695_1.htm) (verified 01 Mar 2012). Miller, S. A., R. C. Rowe, and R. M. Riedel. 1996. Bacterial spot, speck, and canker of tomatoes. Factsheet HYG-3120-96. The Ohio State University Extension. Available online at: http://ohioline.osu.edu/hyg-fact/3000/3120.html (verified 01 Mar 2012). Momol, T., J. Jones, S. Olson, A. Obradovic, B. Balogh, and P. King. 2002. Integrated management of bacterial spot on tomato in Florida. Publication #PP192. University of Florida IFAS Extension. Available online at: http://edis.ifas.ufl.edu/pp110 (verified 01 Mar 2012). Sun, X., M. C. Nielsen, and J. W. Miller. 2002. Bacterial spot of tomato and pepper. Plant Pathology Circular No. 129 (revised) [Online]. Florida Department of Agriculture & Conservation Services. (Available at: http://www.doacs.state.fl.us/pi/enpp/pathology/pathcirc/pp129rev.pdf) (verified 01 Mar 2012). Asian Vegetable Research and Development Center Bacterial Spot (Xanthomonas campestris pv. vesicatoria) [Online]. AVRDC International Cooperators' Fact Sheet. (Available at: http://www.avrdc.org/LC/tomato/bactspot.html) (verified 01 Mar 2012).